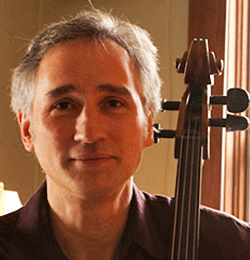 If you don’t know Gideon Freudmann by name, you certainly may have heard him play. The best word to describe his singular style comes from the artist himself: CelloBop. Using the electric cello as his entryway into improvisational classical, blues, jazz, electronic, funk, and folk music, Gideon imaginatively riffs on conventions and traditions. He loops and layers his sounds with pedals and amplifiers, sculpting orchestras out of thin air. Fans describe Gideon’s music as spontaneous yet immediately accessible, so it is no wonder that film, television, and radio producers seek it out. He regularly contributes to NPR’s All Things Considered, This American Life, and CarTalk; his work is featured on Good Morning America, the TV show Weeds, as well as in several films; and he plays solo and ensemble shows in Portland and around the world. At times atmospheric and oftentimes playful, Gideon’s signature sound always exists in its own unique dimension: nuanced, intricate, and fun! Gideon started playing cello when he was eight. His father introduced him to classical music, and after hearing a cellist play at a concert, he fell in love with the instrument. He practiced constantly but also had fun experimenting with sounds when he got bored. He had no idea that this tinkering could be musically useful, but his gift for playing with sounds eventually translated into CelloBop. In his twenties, Gideon began his musical career in earnest, playing in duos, quartets, and as a solo artist. He played as often as possible, sometimes even providing live soundtracks for silent films. Nowadays, Gideon plays everywhere, from house concerts to symphony halls, and he lives by a maxim he’s learned over the years. Beyond the 11 CD’s Gideon has released as a solo artist, many with titles that reflect his sense of humor such as Cello Shots and Ukrainian Pajama Party, he is a founding member and composer for the Portland Cello Project (PCP). The PCP started in 2007 with a threefold mission: “to bring the cello to places you wouldn’t ordinarily hear it, to play music on cello you wouldn’t normally hear played on the instrument, and to build bridges across musical communities.” The group hosts an annual Christmas Sweater Spectacular, and they have been known to play anything from Outkast to original fugues. They played on Prairie Home Companion and they have toured with Buckethead. In 2012, the PCP performed Beck’s Song Reader in its entirety. The album, released as a collection of sheet music intended for people to perform themselves, was a perfect match for the group, who recorded their results. Of course, all of these qualities that Gideon admires sound very familiar. Gideon’s sense of humor and constant quest to keep things fresh imbue his music with a quality that is at once original yet familiar. Family life keeps him busy—his four daughters have humbled him whenever he thinks he can put his own wishes and ambitions first—but his solo gigs, his performances with the PCP, and his playing with Caravan Gogh, a postmodern string band, allow him to do what he loves—play everyday. 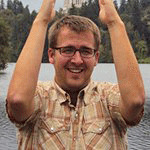 Come hear Gideon speak and play at TEDxConcordiaUPortland (now known as TEDxMtHood) on May 3, 2014. We’re sure it will be a performance to remember.